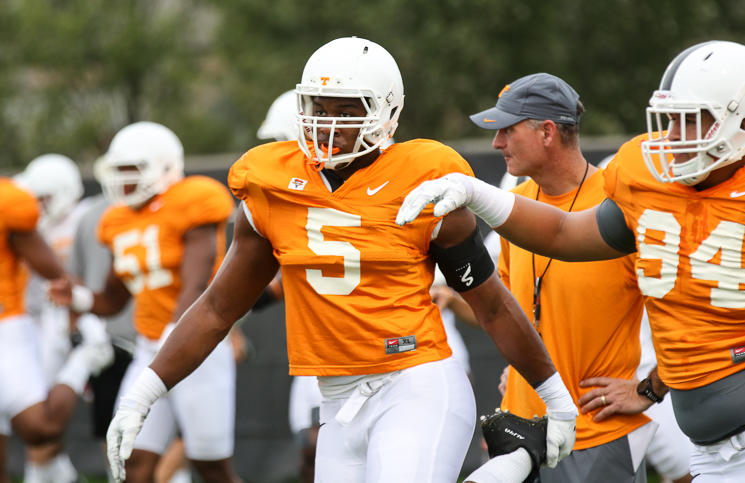 Tennessee lost what might be their fifth defensive lineman for the season, as Butch Jones announced that freshman defensive end Kyle Phillips will miss the remainder of the season on Wednesday afternoon. Phillips, a five-star recruit out of Nashville, appeared in six games, recording eight tackles and one sack on the season in his limited opportunities. He joins freshman Andrew Butcher, senior Trevarris Saulsberry and freshman Shy Tuttle as other defensive linemen out for the year. Senior defensive end Curt Maggitt (hip) has also missed the last seven games after Jones initially gave a 6-10 week timetable for his absence. Jones had an update on him Wednesday as well. Jones said the possibility of Maggitt seeking a sixth year of eligibility is speculation right now and that’s a bride the Vols will cross down the road if needed. Maggitt, who missed all of 2013 with a knee injury and all but two games of 2015 could petition the NCAA for a sixth year of eligibility in 2016 if desired, though it’s unclear if he’d rather explore professional opportunities or not at this point. Jones listed guard Jashon Robertson (ankle) as doubtful for North Texas, while saying that Brett Kendrick and Preston Williams are “iffy.” Marquez North, as he has for much of the season, remains day-to-day. Jones didn’t rule any of them out for the Mean Green, thought it would be difficult to envision Tennessee pushing any those guys back into action this weekend against the 1-8 (1-5 C-USA) squad.